Are you keen on learning all the ins and outs of breastfeeding? Are you the type of person who likes to hold an actual book full of all the information you need without having to search it all out on the internet? If so, you might want to check out a few well-written breastfeeding books. These will be a trusted resource whenever you need them throughout your breastfeeding journey — and if there’s an internet outage, you’ll still be able to use them without waiting for your service to be restored. Use the links above to check the latest prices or read our in-depth breastfeeding book reviews below. When Should I Start Reading About Breastfeeding? Breastfeeding is deceptively simple, and it’s much more complicated than you’d think (source). You’ll need quite a bit of time to read up on it and reflect on how you want to approach it and what equipment you’ll want. If you try to read up on it in the last month of your pregnancy, you might be sorry you waited so long, especially if you go into early labor. You won’t have any of the tools you’ll need and you might feel unprepared if your baby has latching problems or you face some of the common setbacks of breastfeeding. Your best bet is to start reading up in your first or second trimester. That gives you plenty of time to order your breast pump, storage containers and other equipment so you’ll be ready to start when your baby is born. Breastfeeding should be started right after your baby is born (source), so you’ll hit the ground running. Interesting: If you’d rather do anything, including pump your breasts, than read your breastfeeding books, they’re too boring. You’ll never learn enough about breastfeeding if your eyes glaze over every time you try to read about it. Look for engaging books with personal anecdotes. Full of pictures: Sometimes a picture really is worth a thousand words. Nothing helps you understand what an incorrect latch is more than a picture, for example. Someone you can relate to: Most moms like reading an author who feels like a close friend or a wise older sister. If you’re a young first-time mom, you might not want a breastfeeding book aimed at women in their 40s. Here are our five favorite reads for breastfeeding mamas. Work. Pump. Repeat. : The New Mom’s Survival Guide to Breastfeeding and Going Back to Work by Jessica Shortall will help moms balance their busy, demanding careers with their desire to give their baby the best nutritional start in life. Shortall knows what she’s talking about as a mother of two with a demanding career. When she was pumping for her children, she was traveling worldwide with her job with TOMS Shoes. This book covers how to craft in-the-office pumping schedules and how to handle pumping if your job takes you on the road for a few days. Plus, it addresses the less-than-optimal pumping conditions many women face while at work. It shows you how to build a freezer stash and even how to handle uncomfortable situations with co-workers. 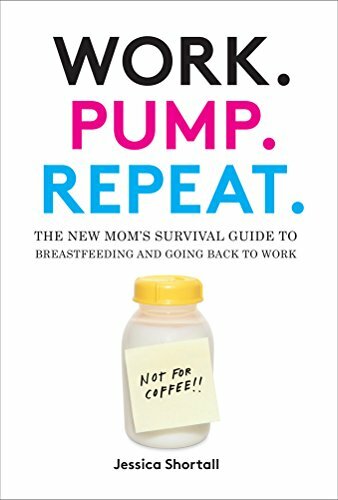 This book will help you realize that you can get through pumping at work, even if it’s not easy. Lots of women have been trailblazers in recent years so you don’t have to choose between working and feeding your baby breast milk. This book will give you plenty of encouraging stories and details provided by working women. Shortall’s conversational tone will make this book an easy and enjoyable read. This isn’t a boring book — it will keep you entertained as you read it. It covers everything you’ll need to know about pumping at work. It’s written by a woman who pumped while traveling globally — if she can do it, anyone can. Some moms might find this a bit heavy on the anecdotes and light on checklists. Even though you’re busy, you might wish this book was a little longer than 208 pages. New moms are starting from scratch so they need to learn everything there is to know about breastfeeding. What you need as a new mom is a comprehensive manual. You’ll be surprised at how many details there are to know and remember. Finally, a book that admits that breastfeeding isn’t instinctual. Women who feel they have been given mixed messages about breastfeeding will appreciate this book. Many of us have been told that they’ll automatically know what to do when it comes time to breastfeed, but they hear the stories from woman after woman about how challenging it really is. 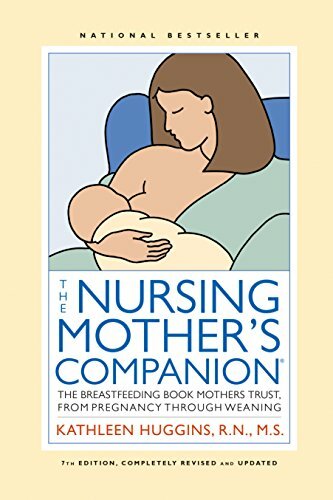 In Kathleen Huggins’ The Nursing Mother’s Companion, 7th Edition: The Breastfeeding Book Mothers Trust, From Pregnancy Through Weaning, she lets women know that breastfeeding is a good choice, but women and babies don’t always know how to do it without instruction. First-time moms will feel better knowing that breastfeeding isn’t something they should magically know how to do. This book will give them the solid groundwork they need for success, such as reviews of breast pumps and figuring out how much milk your baby needs. It’ll also show you have to overcome some of the challenges and setbacks you might experience along the way. Even more than that, it gives you some non-breastfeeding advice you might be wondering about, like co-sleeping and the risk of SIDS. Readers can trust that Huggins knows what she’s talking about because she is a lactation consultant and a registered nurse. At 368 pages, this a thorough book. Huggins has medical training, which gives her a lot of credibility with readers. The book is well sectioned so you can easily find the information for the stage that you and your baby are currently in. Some sections can get a bit repetitive. There is some information in this book that’s highly debatable, such as having babies take fluoride supplements. 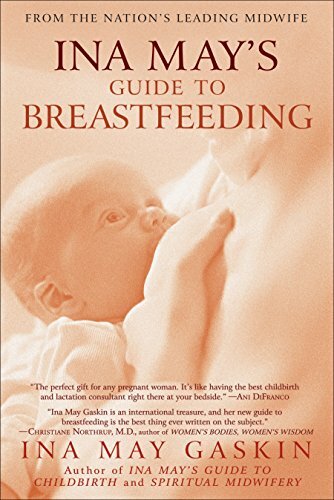 Any breastfeeding book for moms of twins should give you all the basics that moms of singles don’t have to worry about, such as how to feed two hungry babies at the same time. It may seem overwhelming at first, but with a little practice, you’ll be able to feed them both at once with no problems. This book has a special chapter that covers twins and breastfeeding. Moms who have multiples should love that section and will learn a lot about how to multitask safely. One of my favorite chapters is “Problem-Solving During the First Week.” When you’re a mom, you may run into setbacks even though you have the best of intentions, then decide to throw in the towel because it’s too hard. But if you use this chapter to get you through the rough patches, you’ll get that much closer to reaching your breastfeeding goals. 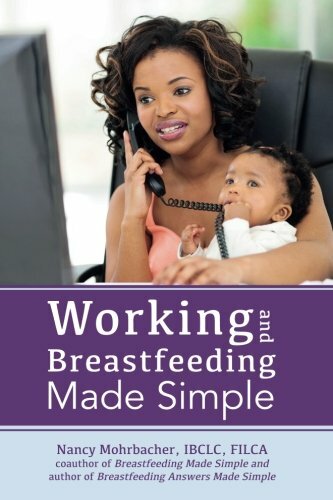 Other chapters involve what to do when your baby gets sick, working outside the home, the basics you’ll need to begin breastfeeding, sleeping arrangements and even weaning. Readers who aren’t familiar with author Ina May Gaskin can rest easy that they’re getting their advice from a certified professional midwife. She isn’t new to the field either — she was doing it long before it became trendy, with over 30 years in the field. This book is 352 pages and will take you through your baby’s first day until they no longer need to be breastfed. The author has tons of experience as a midwife. The book visits the health benefits of breastfeeding, which is a powerful motivator when times get tough. It includes information on twins, which is an area some books neglect. Some moms felt the section about breastfeeding after returning to work could have been more informative. The book also covers the history of breastfeeding in America, which is something some moms may not be interested in. This book by Nancy Mohrbacher has a whole chapter dedicated to the different timeframes in which women might be going back to their jobs after giving birth. It tells you vital information for each period of your baby’s life when it comes to breastfeeding and pumping, like how much milk is needed. Women who like their books with plenty of detail will appreciate this chapter. It doesn’t just stop at moms in the workforce, but also focuses on moms who’re back in school when they’re attempting to breastfeed. Going back to school when you’re breastfeeding makes things even more challenging, so it’s encouraging that there’s a chapter specifically addressing this. Another important chapter is the one about realistic pumping expectations. Moms often attach a breast pump and think the milk is going to start flowing like they’ve just turned on a faucet. But in reality, it’s more like when your faucet won’t quit dripping. The author has a lot of experience with breastfeeding — she even operated a private lactation business for 10 years. This is really thorough, covering both breastfeeding and pumping. The author knows what she’s talking about. The section about the baby’s milk needs by age is particularly helpful. Some moms felt this book could have been much shorter. You may prefer a book that’s a little bit more personal and less authoritative. If you don’t plan to breastfeed, but you know you want your baby to have breast milk, pumping is what you’ll have to do. Exclusively pumping will still allow your baby to have the nutritional benefits of breast milk and with a good book at your side, you’ll be a pumping pro before long. Exclusively Pumping Breast Milk: A Guide to Providing Expressed Breast Milk for Your Baby by Stephanie Casemore is a good resource for moms who can’t or choose not to breastfeed, but still want their babies to have breast milk. Pumping isn’t easy work and believe it or not, some moms look down on pumping compared to breastfeeding. This book deals with the emotional aspect of exclusively pumping and the feelings it can bring up for moms. It also has tips for increasing your milk supply and tips for getting past some of the biggest obstacles you’ll encounter. Moms of preemies will appreciate the special advice just for them, and all moms will like the detailed storage information. Beginners can use the schedules she offers because until pumping becomes a routine, it’s helpful to visualize how often you should be doing it. Casemore learned about exclusively pumping when she became a mom herself. In addition to being a mom, she’s a writer and teacher who lives in Canada. The book is 284 pages long and it is full of information to help women with the daily ins and outs of pumping, both emotionally and physically. This might encourage you to pump longer than you would have otherwise. The book is organized well. Every aspect of exclusive pumping is covered. There’s a fair amount of repetition, which some moms may not like. Some thought the book could have had a more engaging tone. Half the battle with breastfeeding is not giving up. 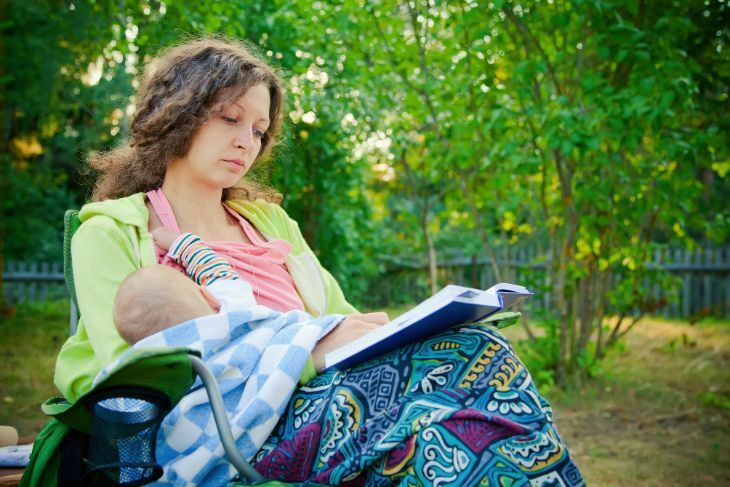 And to keep you in the game, the best breastfeeding books need to inspire you. That’s why Work. Pump. Repeat. comes out on top for me. It’s for working moms, but ones who are dedicated to doing the best for their babies. It’s by someone who’s had to walk the walk, not just talk about it. You’ll be entertained as you’re reading and you’ll be learning along the way. It’s a lot like parenthood in that respect! Are there any brilliant breastfeeding books out there that we’ve forgotten to mention? We’d love to hear your recommendations in the comments.